I have over 40 years experience with horses. There are few areas of equestrianism with which I have not been involved:- I have experience in Racing, Eventing, Show Jumping, Dressage, Hunting, Polo, Shows, Pony Clubs, Riding Clubs, Riding Schools, Trekking Centres and Livery Yards. Provided over 900 written expert witness reports for over 90 firms of solicitors as both a single and as a joint expert. Given oral evidence on over 50 occasions, in both the County Court and the High Court, in cases involving all areas of equestrianism. Current Registered British Horse Society Intermediate Instructor and British Eventing Accredited Trainer teaching a variety of private clients. Pony Club instructor over many years. Head of Equine Business Management at the Royal Agricultural College, Cirencester, 1994-99. Member of the Animal Care & Equine Training Organisation Horsemastership Working Group. Speaker at major British Horse Society, Pony Club, Association of British Riding Schools and Medical Equestrian Association Health and Safety seminars. For 16 years held a Category B Amateur Permit, allowing me to race against professional jockeys, in UK and Germany, in both flat and jump races. Past winner of the Grand Military Gold Cup plus other Hunter-Chases and Point to Points. Manager of the Racecourse Department of The Jockey Club and National Point-to-Point Controller, 1999-2000. Current Steward at Sandown, Kempton Park and Wincanton Racecourses and on Point-to-Point courses. Qualified Chairman for National Hunt and Flat meetings. Joint author (50% contribution) of British Horseracing Board Racecourse Training Manual. Jockey Club assessor for steeplechasers with poor jumping record. 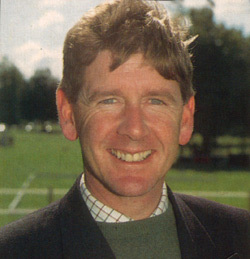 Team Manager of the British Three-Day Event Team (1992-6) during which time the Team were World and European Champions and 5th at the Atlanta Olympics. British Eventing, International Equestrian Federation and Pony Club Steward. Served as Chairman of the Medical Sub-Committee of the British Eventing Standing Committee on Safety of Cross-Country Courses in Eventing. Health and Safety Adviser to International One-Day Event. Referee for carriage Driving trials at Royal Windsor Horse Show. Foreign Delegate on Jury of Appeal for the USA National Driving Championships, 1990. Chaired disciplinary panels for the British Equestrian Federation, British Eventing and British Showjumping. Have hunted since 5 years old with over 10 packs of hounds in UK. Drag hunted in Germany and hunted in USA. Equestrian professional on Harper Adams/Warwickshire University College Equine Degrees Validation Panel. Health & Safety advice to racing, eventing, and horse welfare yards and riding schools, and an international horse competition, including preparation of Risk Assessment and Health & Safety Policy. Commanding Officer, The King's Troop RHA, 1991-93, with responsibilities for 120 horses and 180 personnel including Farriers, Saddlers, Veterinary Officer, Horsebox Drivers, Grooms, Foragemen and Equitation Instruction Staff. Second-in-Command, The King's Troop RHA, 1985-88. Advanced Military Equitation Course 1984-85, top student.